When it comes to the automotive shell game, in which manufacturers shuffle around rebadged and rejiggered models to trick people into buying something they've already rejected, the house usually wins. But sometimes it works out for everyone—like when a weird little orphan from a defunct marque is transmogrified into the best version of the best-selling nameplate in automotive history. This is the all-new 2019 Toyota Corolla Hatchback, and it's probably what the economy car should have been all along in this country. A quick free association exercise: What do you think of when you hear the word "Corolla?" Cheap, bare-bones, boring, soul-deflating, or probably some variation thereof. But the new hatch, formerly known as the Scion iM (then, weirdly, the Corolla iM when the Scion brand crashed and burned in 2016), is on a mission to change your mind with some welcome updates in key areas. A fresh design and platform, a newly tech-forward interior, and a specially-developed six-speed manual transmission with active rev matching all make it the most fun-to-drive Corolla in at least two decades. It's not a hot hatch (nor is it a "haute hatch," as the press materials put it), but it is a striking return to form for a company that once defined itself by its humble, unbeatable cars for everyday people. The Corolla Hatchback pulls off that same honest and straightforward vibe without feeling lazy or incomplete, a tricky act in an age of enhanced expectations. After a day in the hills around San Diego with the new car, I realized there's some definite soul here—a slightly reserved, sensible soul, but soul nonetheless. And did I mention the manual transmission? The bright Polestar-esque blue egg you see before you traces its roots to the Scion iM, which was really a rebadged version of the international Toyota Auris hatchback. 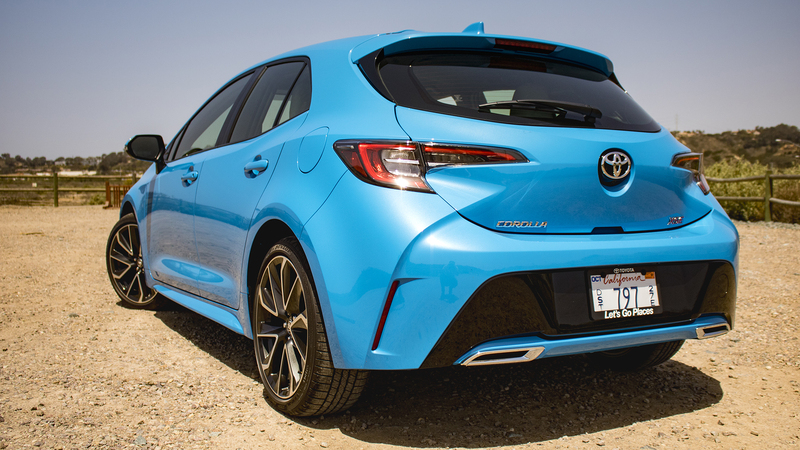 Toyota already sells the Auris as the Corolla Hatchback in certain markets, and it only makes sense to unite the two cars under a single nameplate here in America as well. That weird "iM" suffix just wouldn't do anymore. That's partly because the Corolla is the best-selling model in history, period, with over 40 million cars sold worldwide to date, and it remains a powerful draw for people looking for reliable transportation even as we shift away from sedans. 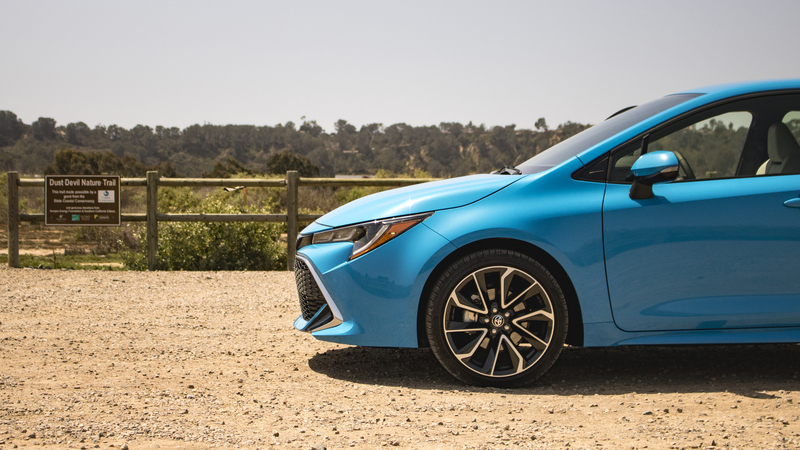 But it's also because the two body styles will soon be more related than ever: The Corolla Hatchback rides on one of Toyota's New Global Architecture modular platforms, the same one that will underpin the new sedan when it comes out at the end of the decade. With probably the cleanest interpretation yet of Toyota's corporate fascia, the new hatchback is leagues above both the Corolla iM and the outgoing sedan in terms of exterior design. The stylish "Triple J" LED headlights—standard, though the higher XSE trim gets adaptive beams—frame a grille that's mercifully free of excess. It also helps that the hood sits about two inches lower than before, which enhances the sleek look nicely. The new model is also a smidge lower and wider; though it's not as long, the wheelbase has been extended, which pushes the wheels further towards the corners. It all weighs in around 3,060 pounds. When the 2019 Toyota Corolla Hatchback rolls onto dealer lots later this year, it will come with but a single engine choice: a 2.0-liter inline-four "Dynamic Force" engine putting out 168 horsepower and 151 pound-feet of torque, increases of 31 and 25 respectively from the departing Corolla iM. It's also a significant power bump compared to the sedan. But the real story here is the brand-new six-speed manual transmission, which was specifically developed for this new model. Toyota deserves credit for doing its part to save the manual, spending untold time and money building a gearbox that aims to help ease new drivers into rowing their own. At the push of the button, you can activate the transmission's "Intelligent" mode, where it adds in active rev matching, stall prevention, and a smooth-shift feature that's bound to make anyone feel like a more competent driver than they are. And it's obviously still a lot of fun to use in the less-intelligent mode, with a well-weighted clutch and satisfying shifter throws. Even the CVT makes a good case for itself, thanks to the addition of a fixed, clutch-engaged "launch" gear that makes it feel as responsive as a normal transmission off the line. The throttle does get a little rubbery once the CVT engages above 25 mph, and the launch gear doesn't re-engage like a traditional first gear when you slow back down to a crawl, but it's a marked improvement over nearly every other continuously-variable transmission on the market right now. The steering wheel paddles also offer simulated shift points, which snap into existence with a notable immediacy and hold nicely regardless of speed. The CVT also offers standard auto-hold so you don't have to keep your foot on the brake at a stop—one more convenience for your daily commute. The Corolla Hatchback is a light, direct handler—agile might be too strong a word—and its revised suspension (MacPherson struts in the front, multi-link in the rear) offers a firmer ride than in the past. It's not uncomfortable by any means; rather, it pretty much nails the sweet spot between softness and performance. The steering is typical-new-car numb, but it feels solid and connected. There's no question that the sporty trims from its competitors—think the Volkswagen Golf GTI, or the Honda Civic Si—would eat this thing's lunch. But if we're talking base model vs. base model, the new Corolla Hatchback has vaulted itself to new heights here. The rumor mill suggests a racing-oriented Corolla Hatchback might be in the works, but a direct question to one of Toyota's reps on the subject was met with the customary blank face and "We're-looking-into-it-now-stop-asking-things-you-know-we-can't-answer" response. Driving a Corolla has long meant doing without. Sure, it will get you from A to B, but features and options have traditionally been secondary to its mission of wholly-anonymous transportation. Thankfully, with an airy, minimalist interior anchored by an Apple CarPlay-equipped 8.0-inch touchscreen and a suite of standard features, that's no longer the case. 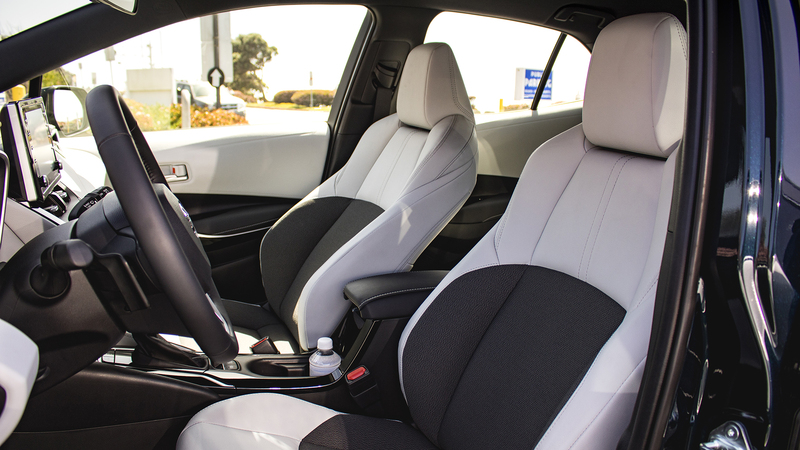 The two-tone motif mixes white and dark surfaces on the dashboard and seats for a nice layered effect, which is further bolstered by an interesting mix of soft-touch materials throughout. 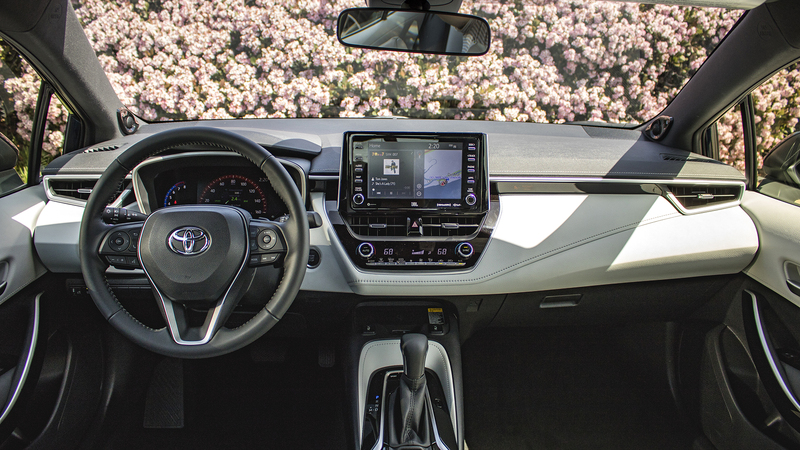 The old Corolla sedan has an awkward, upright dashboard that has the odd effect of making you feel like you're sitting behind a wall; the hatch's sloping, more-modern design fills the forward space nicely. Like the exterior, nothing is excessive or overdone. The front row is noticeably more spacious than the back, but that's to be expected in a compact car. 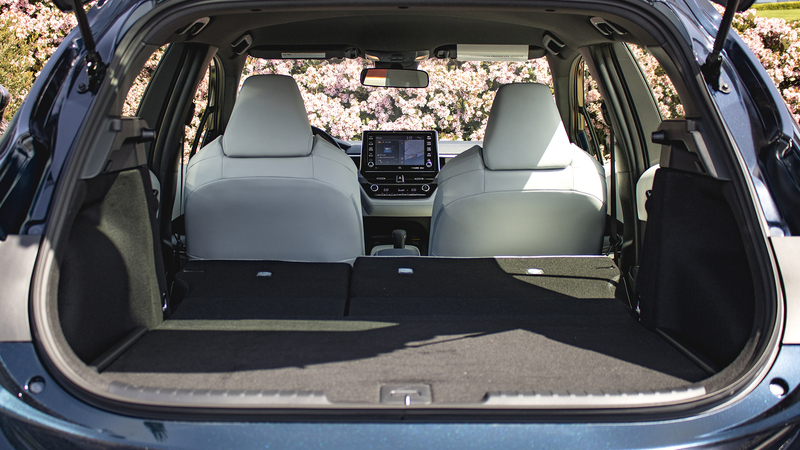 The 18.0 cubic feet of cargo space behind the second row isn't particularly impressive, but the seats fold down to create a flat (if a little high) load floor. In addition to Apple CarPlay (no Android Auto for now), that 8.0-inch toushcreen packs the latest version of Toyota's Entune infotainment operating system, which means it offers goodies like remote monitoring and Amazon Alexa integration. And most importantly in our book, it retains physical buttons for important tasks like changing the volume or radio station. And thanks to better sound insulation, the soundtrack to your commute won't be the agonizing drone of a CVT, but whatever is streaming out of the optional eight-speaker JBL sound system. A Qi wireless smartphone charging station is also available; two USB ports come standard on both trims. Toyota has taken pains to make buyers of the lower trim feel less like they're being punished, and the result is fewer differences in interior niceties than you'd expect for something at this price point. The base models still get things like a leather-wrapped shift knob and steering wheel, four automatic windows, and automatic climate control. 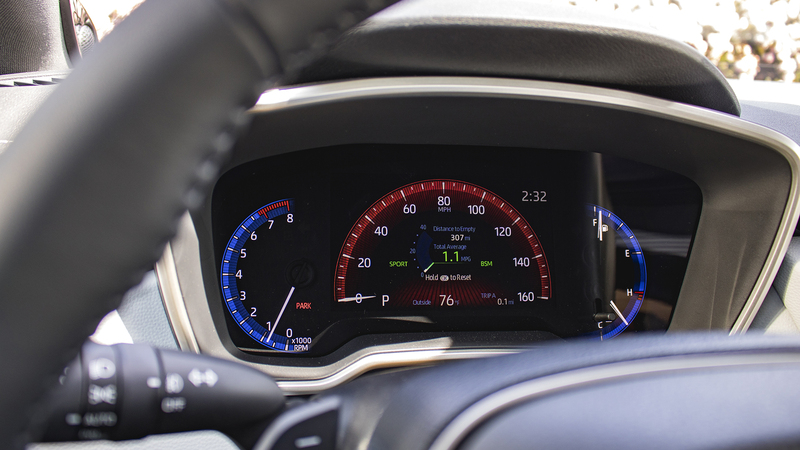 The higher XSE trim gains goodies such as dual-zone climate control, heated front seats, and a 7.0-inch digital display offering vehicle information (and nifty animations) in the middle of the instrument panel. Perhaps the most important thing that both trims share, at least in terms of everyday use, is the latest generation of Toyota's Safety Sense suite of driver aids, all of which come standard. That means full-speed radar-guided cruise control (though it only works above 15 miles per hour with the manual transmission), lane departure warning and prevention, automatic emergency braking with better bicycle and low-light pedestrian detection, automatic high beams, a "Lane Tracing Assist" feature that works in conjunction with the cruise control to take some of the burden off a long drive, and a camera-based "Road Sign Assist" that projects "Stop," "Yield," "Do Not Enter," and speed limit signs onto the instrument panel. Nifty. 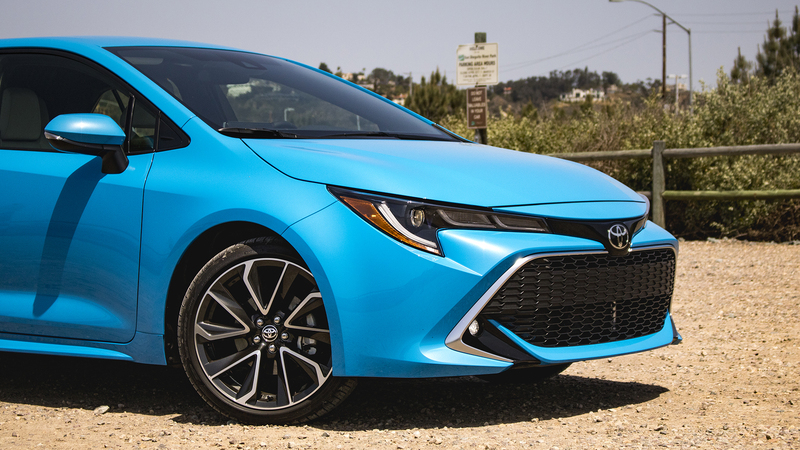 Details on specific prices (along with other important figures like an official EPA fuel economy rating and seat-down cargo capacity) for the 2019 Toyota Corolla Hatchback haven't been released yet, but look for it to continue to offer the same value that's made the Corolla a heavy hitter in the world of compact economy cars. For reference, the outgoing Corolla iM starts at $18,850—and remember that even if the new base price breaches $20,000, you're still getting way more standard features in the new model. The standard Toyota Safety Sense features should be of particular interest to those looking for a safe, honest, and reliable car, while the new manual transmission provides a much-needed dose of levity and fun. Really, the Corolla Hatchback is what should have been offered all along, especially considering how buyers are turning away from sedans. I can't think of a single reason I'd chose the sedan over the hatchback; the two-box is better to drive, better to look at, and better to live with. Granted, some of those shortcomings will be addressed in the new model, due out by 2020. But that's still a couple years away; in the meantime, this is the Corolla worth buying. Or, y'know, renting. All right, that's unfair. 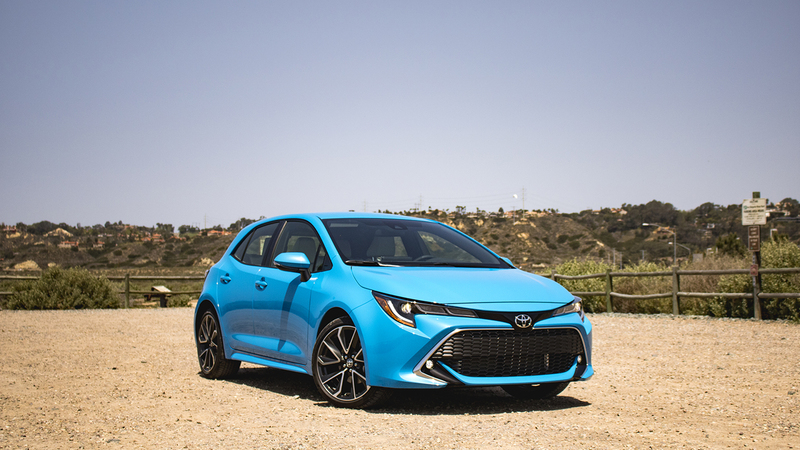 In reality, the 2019 Toyota Corolla Hatchback is the first car in a while that captures some of that magic that made the company's older cars so appealing. Nearly everything feels well-thought, honest, and straightforward, and it manages to deliver some important upgrades without spoiling its essential character. There are no surprises here, as you would expect in something that deigns to join the ranks of the best-selling car in history. So the Corolla Hatchback exceeds expectations on many counts—provided they were properly calibrated in the first place. Do yourself a favor and ignore anyone who earnestly declares this a hot hatch—like, say, an overly enthusiastic Toyota representative. It's not; it's an extraordinarily competent economy car, and really, that's more than enough.